Welcome to my Fall and Thanksgiving powerpoint lesson plans page that focuses on fun powerpoint teaching resources to use during autumn and the month of November. This page contains English and Math powerpoint presentations that cover the following topics: plural words, adverbs, adjectives, word problems (that involve money, multiplication, and addition), and fun animated puzzles that review addition and subtraction equations. Since it is difficult to describe each of my Thanksgiving powerpoint lesson plans in words, I have made a video of each presentation for you to watch. These videos will give you an idea of what each lesson activity contains, as well as helpful teaching tips. I hope that you find these videos useful, but please be aware that I am an extreme novice at making videos! I have designed my powerpoint presentations to be engaging to your students. The powerpoint lessons on this page are designed with bright autumn backgrounds and animations. 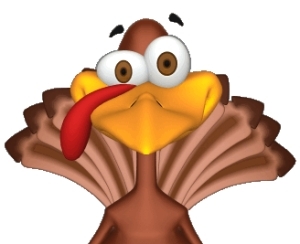 I use funny and attention grabbing animations when I am designing my Thankgiving powerpoint lesson plans. I also use colorful autumn background templates for the powerpoint presentations that I prepare. Many students find traditional grammar and math exercises boring and dull. I encourage you to use these engaging Fall and Thanksgiving powerpoint lesson plans to bring life to these typically boring lessons. Click on the Add to Cart button above to buy this Thanksgiving powerpoint presentation. Save and reuse these Thanksgiving powerpoint teaching resources forever! 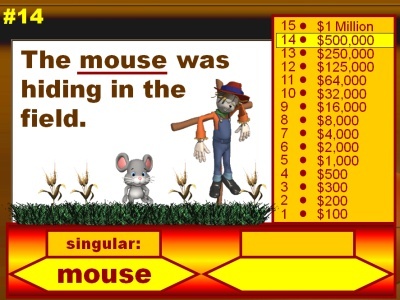 These powerpoint lesson plans are set up in the same style as the popular game show Who Wants to Be a Millionaire. 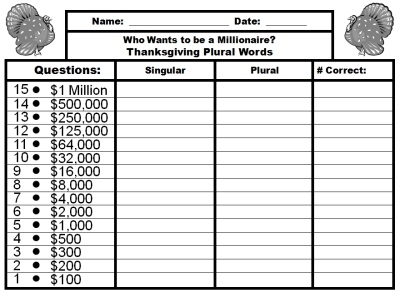 Your students will love playing this fun Thanksgiving activity while they are reviewing singular and plural words! Engage your students in reviewing changing singular words to plural words with this fun set of Thanksgiving powerpoint lesson plans! 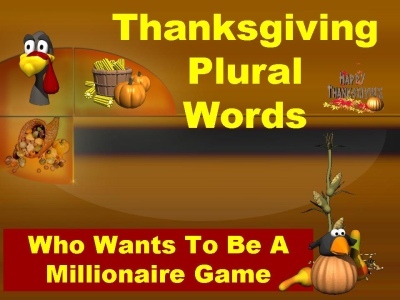 Below you can watch a short video that demonstrates my Thanksgiving singular and plural words powerpoint presentation. 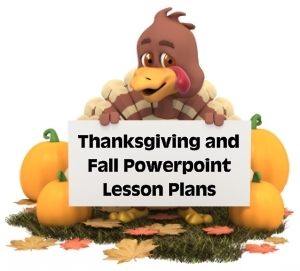 Thanksgiving powerpoint lesson plans video demonstration. 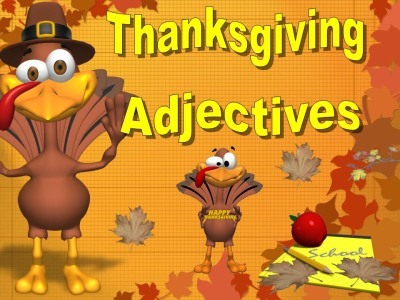 There are 20 sets of question and answer slides in this Thanksgiving adjectives powerpoint presentation, as well as a student response worksheet for students to write their answers on. 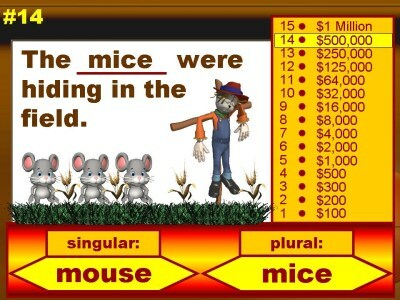 This fun lesson activity requires students to select the adjective in each sentence and the noun that it modifies. Students have to decide if the adjective describes what kind, which one, or how many. Your students will love playing this engaging Thanksgiving activity while they are reviewing adjectives! This powerpoint presentation includes a student response worksheet (shown below) for students to write their answers on. Engage your students in reviewing adjectives with this fun set of Thanksgiving powerpoint lesson plans! Below you can watch a short video that demonstrates my Thanksgiving adjectives powerpoint presentation. After reviewing adjectives using this Thanksgiving powerpoint activity, I have designed a Thanksgiving adverb powerpoint lesson activity which you will find below. There are 20 sets of question and answer slides in this Thanksgiving adverbs powerpoint presentation, as well as a student response worksheet for students to write their answers on. 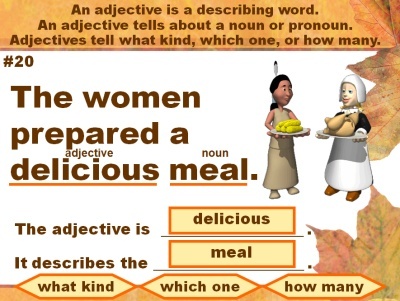 This lesson activity requires students to select the adverb in each sentence and the verb that it modifies. Students have to decide if the adverb describes how, when, or where. Your students will love playing this fun Thanksgiving activity while they are reviewing adverbs! 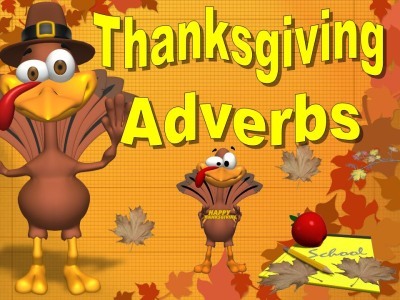 Engage your students in reviewing adverbs with this fun set of Thanksgiving powerpoint lesson plans! Below you can watch a short video that demonstrates my Thanksgiving adverbs powerpoint presentation. 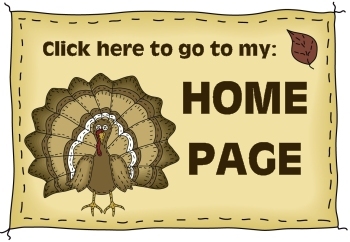 Thank you for visiting my Thanksgiving powerpoint lesson plans page. on my website, click on the links that are found below. and go to my home page: Unique Teaching Resources.